Juan Mata scored two sublime goals as the ever-improving Manchester United displayed one of their finest performances of the season to topple Liverpool at Anfield. A spine-tingling atmosphere, as per usual, fueled the revved up players as a mouth-watering battle for the top four began to mold into shape as 5th place Liverpool welcomed 4th place Man Utd to Anfield. United brought their philosophy of dominating possession in the midfield and using Fellaini to test Can, use his strength and create chances up top. It was working as frequent heads down found United players such as Herrera, Mata who were presenting themselves as play-making threats. As the away side continued to dominate play in the middle and a superb goal came out of it. Fellaini started the build up with a short pass to Herrera who carved a slick ball through to Mata running on the inside of Moreno. With only Mignolet to beat, the Spaniard tucked away to his left; adding the final touch to a sublime attacking move. Jones absolutely wrecked Lallana in the middle with a rash high challenge. The English midfielder was on the ground in need of immediate attention, however moments later to everyone's relief he managed to play on after a hefty knock. United lost their focus for a brief moment as Sterling pounced with a speedy run followed by a promising pass in the middle for Sturridge. De Gea, quick on toes, retrieved the ball to cut out any danger. Liverpool broke once more as Anfield suddenly became raucous. Henderson opened a promising move by curling the ball over to Sturridge, who cut it back to an ambitious Lallana who fired a shot just wide of De Gea's goal. Solid move from the home side. Steven Gerrard, now even a minute after being substituted on was unbelievably sent off! Herrera initially stormed in on the Englishman, his challenge later being deemed as a yellow card but Gerrard's ridiculous retaliation of stamping on his Spanish opponent sent him packing with a straight red. Man Utd would double their lead on the 59th minute with a quite sensational goal. Di Maria scampered through the centre and flicked a superb ball over to Mata in space. With the ball still traveling in the air, the Spaniard positions himself for a bicycle kick where he latched onto it with his left foot and directed the ball past Mignolet. Absolutely sublime goal. Another chance presented itself for the confident United side who were chasing a third goal. Di Maria picked up possession down the left and used his blistering pace to charge forward and assist either Rooney or Mata waiting in the middle. He opted for his English team-mate at the back post but the ball frustratingly crept away from Rooney awaiting a pass. Liverpool brought on Mario Balotelli in need of two goals for at least a draw. Moreno made way. 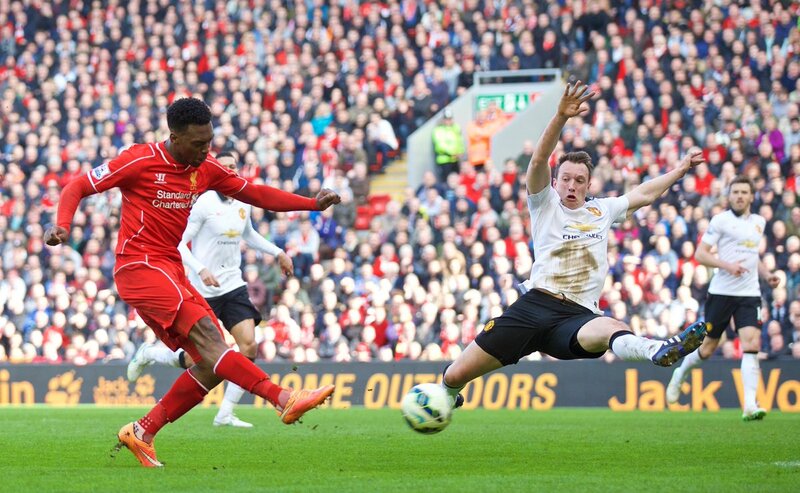 All of a sudden Anfield resurged in hope of gaining a result from a game that United had almost dominated. Coutinho stabbed a deflected ball through the away side's defence that found Sturridge scorching past Jones into the box. The English striker latched onto it and fired a right-footed strike past De Gea at his front post. Smalling stupendously sent Sturridge to the ground with a poorly timed challenge as Balotelli eyed an ambitious free-kick. The Italian struck one, but the ball thumped against United's wall as a raucous Anfield revved up the home side in need of just one goal for a draw which would seem like a victory for them considering the circumstances earlier on. Blind charged into the area but a ridiculous, and unneeded challenge from Can gave United the perfect chance to wrap the game up. Rooney stepped up to take the penalty, but a poor one enabled Mignolet to palm the ball away to his right. Proceedings were concluded with De Gea claiming that Skrtel trod on him in the dying second as the Liverpool centre back protested his case. But, for this season, it's Man Utd who did the double over the Reds with a solid 2-1 win. 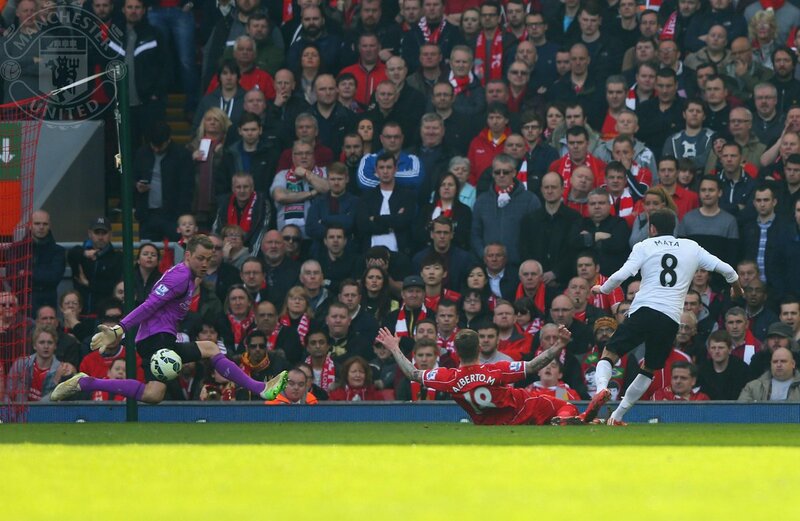 A double from Juan Mata sinks Liverpool at Anfield.